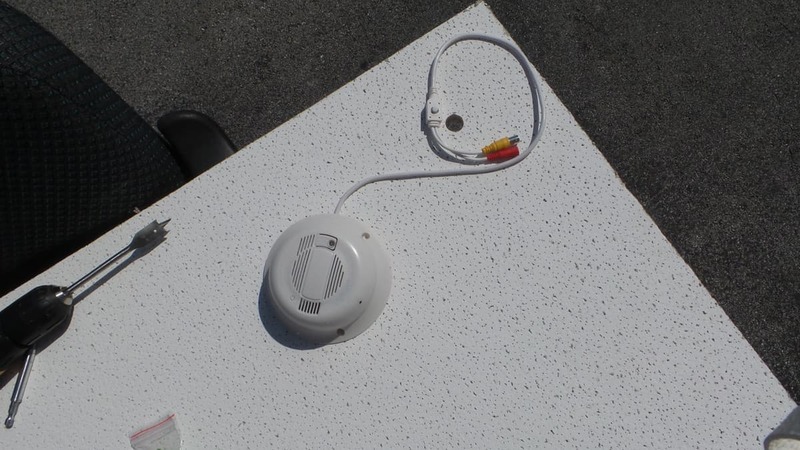 This article will discuss how to install this smoke detector cam to ceiling tiles and also provide some sample surveillance videos that this camera captured. 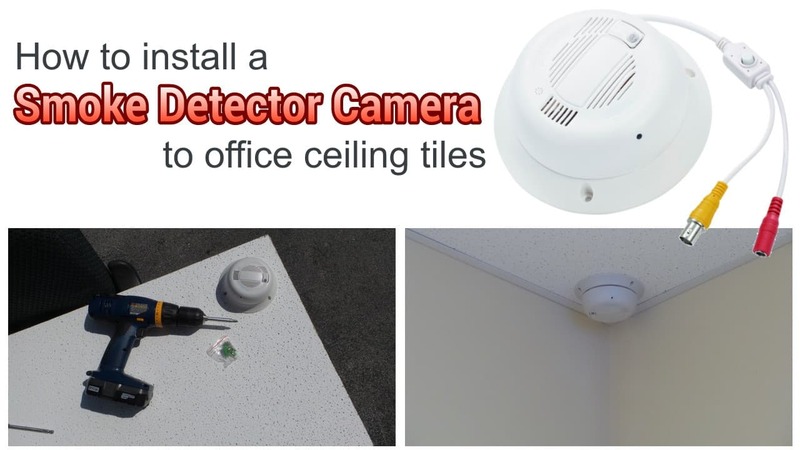 For businesses with ceiling tiles, this CCTV camera is extremely easy to install. Anyone that does simple DIY projects can handle it. For a typical home installation, the concepts described in this article are the same except that the camera is typically installed to a drywall type ceilings instead of ceiling tiles. The HCPRO-SD380 has a 3.7 mm lens that provides an 86 degree field of view. 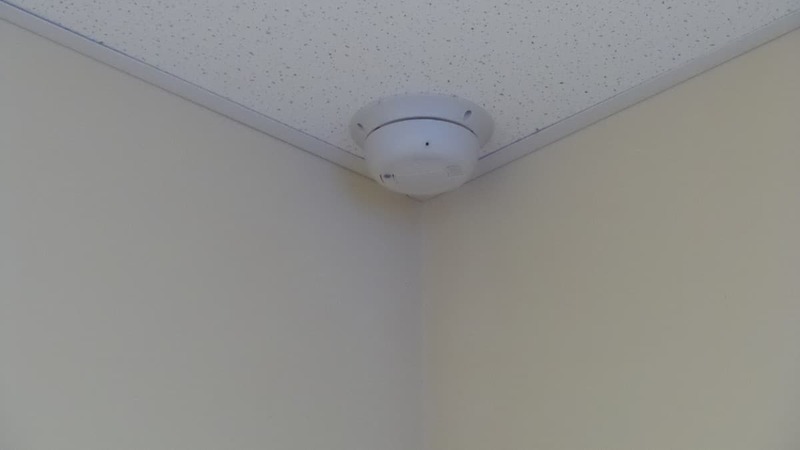 When mounted in the corner of a small to medium sized room, it can capture surveillance for the whole room. Remove the ceiling tile that the camera will be mounted to. Make sure to compensate for the width of your ceiling tile tracks (typically one inch) if you are going to mount it in the corner and make a spot directly diagonal from the corner of the tile. You should place the camera against the ceiling tile before drilling the hole to locate where the cable need to feed through. Using a 3/4 inch drill bit, drill the cable hole. The 3/4 inch hole is just enough space for the video and power cable along with the OSD joystick controls. Most installations will not require modification to the camera settings, but this camera’s OSD (on screen display) settings do allow installers to tweak the camera to compensate for your specific environment. For example, if your location is dimly lit, you can increase the brightness of the camera using this joystick controller. It is a good idea to do this before mounting the camera so you have easy access to the joystick. For 95% of installations, the factory default settings work great and most users do not need to adjust anything. Next, feed the power and video cable through the hole. Position the pinhole lens of the camera in the direction that you want it to face. 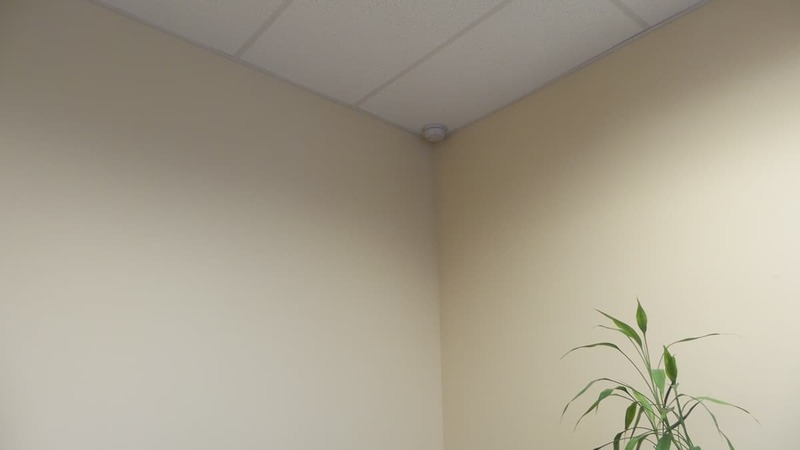 For our corner mount office installation, I align the lens with the corner of the ceiling tile. The camera includes three mounting screws. 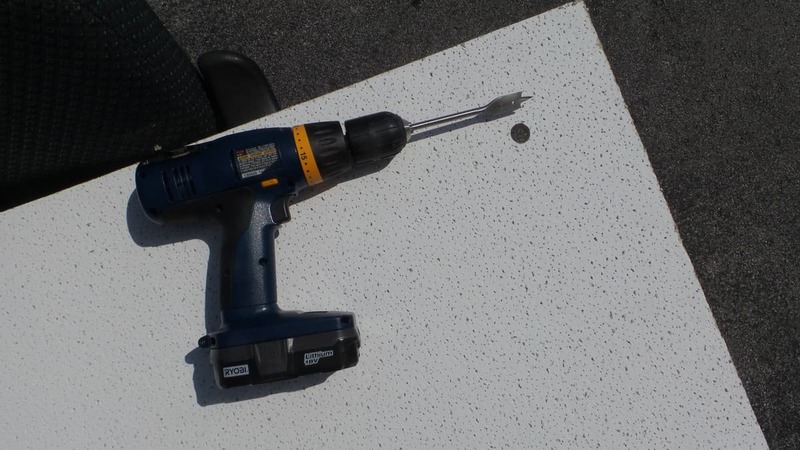 These easily self-drill into the ceiling tiles. Just be sure not to over tighten because the tiles can be fragile. This camera is light enough that the three screws securely hold the camera in place without using anchors. Before you insert the ceiling tile back in place, connect the video and power leads of the camera to the cable that you are using. 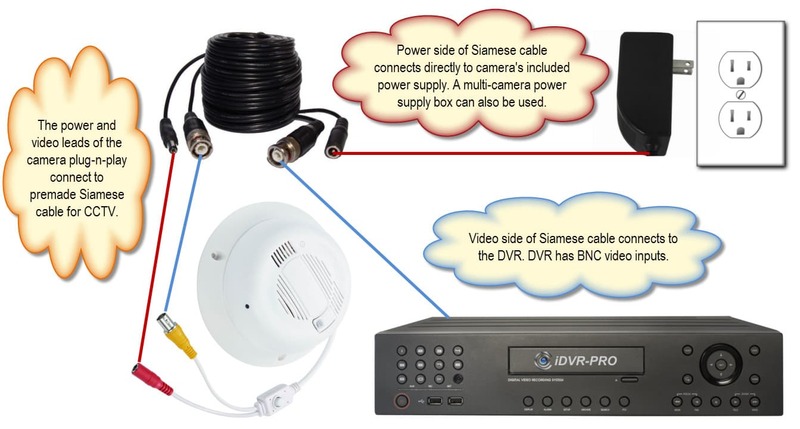 The simplest way is to use pre-made Siamese cable for CCTV, which runs both the video and power of the camera back to the location of your DVR. Another option is to use a spool of RG59 cable which can be cut to an exact length and requires that you attach the BNC connector ends to the cable. 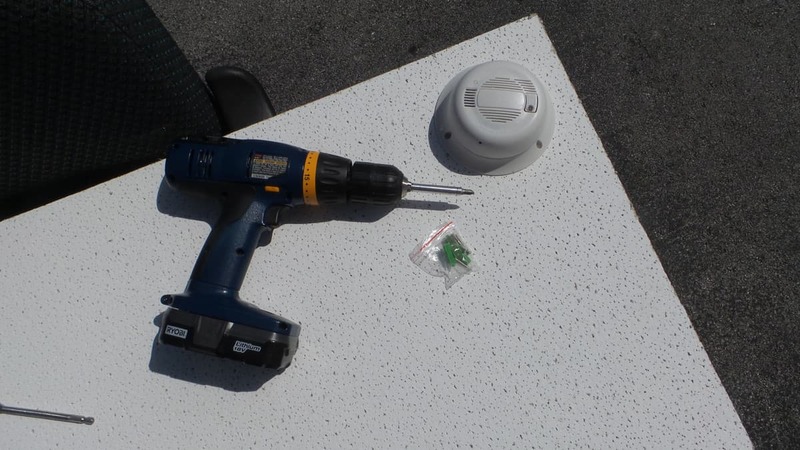 Here are some CCTV camera installation kits that includes the RG59, connectors, cutters and crimping tools. This diagram shows how to wire your camera to your DVR and power supply using premade Siamese cables. This is what the camera looks like when the installation is complete. From a normal viewing distance, the pinhole spy lens is barely noticeable and most people would not suspect that a camera is hidden in the smoke detector even if they see the small spot on the front of the smoke detector housing. This video shows the quality of the surveillance video that the HCPRO-SD380 is cable of recording. This video demonstrates how the HCPRO-SD380 can be used with an iDVR-PRO CCTV DVR to detect motion and send a push notification to iOS and Android mobile apps. 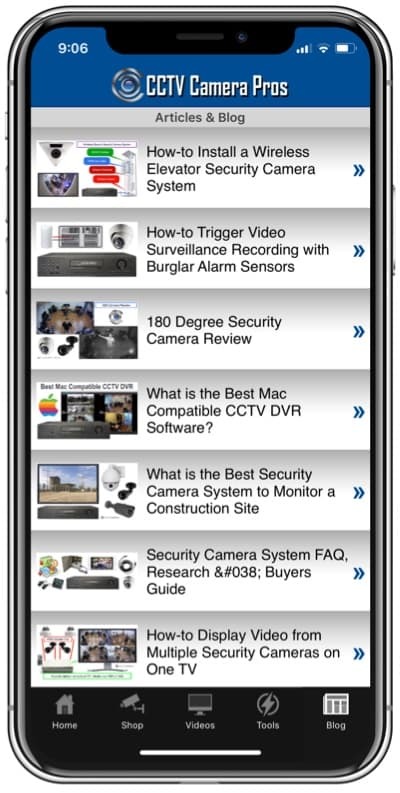 You can learn more about the HCPRO-SD380 smoke detector camera here. 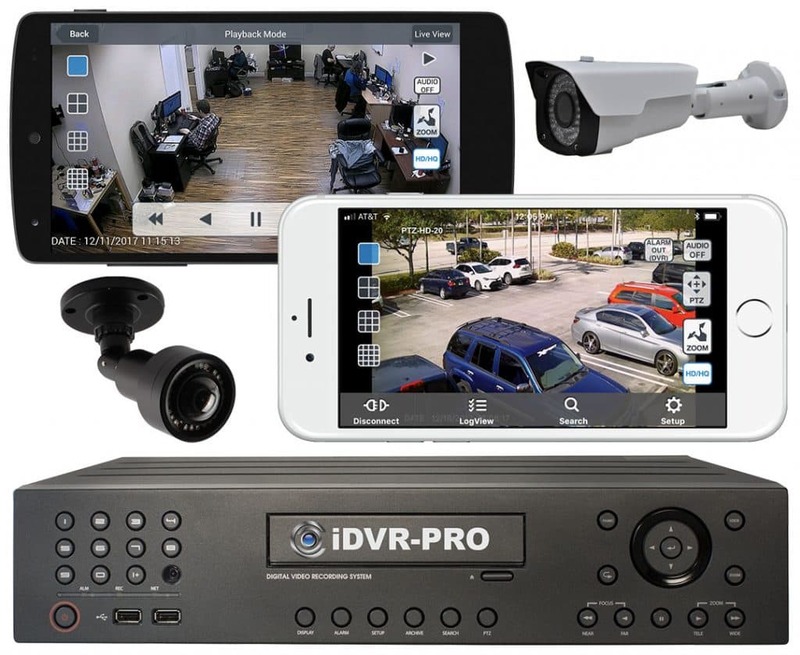 You can learn more about the iDVR-PRO CCTV DVR here.